The late Patsy Getz 52D 54N 58MN would have been proud when her granddaughter, Jessica Getz 12OX 14N, received her BSN last May. Jessica is surrounded by members of Corpus Cordis Auream. 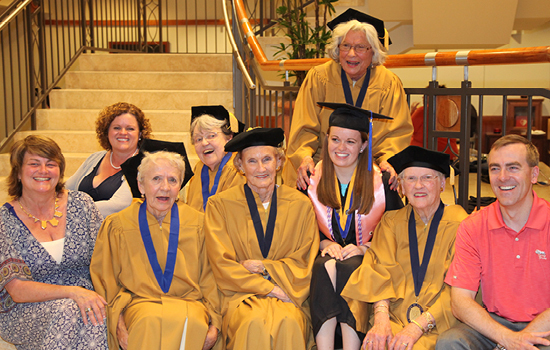 These alumni, who graduated 50-plus years ago, marched at commencement in honor of Patsy. Pictured with them are Jessica’s parents, Kathy (back row, far left) and Miller Getz (front row, far right), both 89OX 91C, and Jessica’s aunt, Anna Getz (front row, far left). 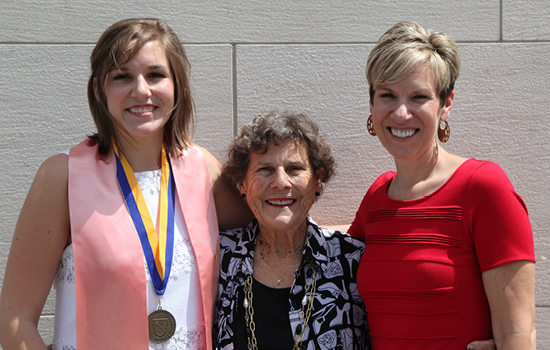 Lillian Davis Byrd 53N (center) celebrated the graduation of her granddaughter, Graham Ellen Byrd 14N. Graham is the daughter of Eve Byrd 86N 98MN/98MPH, president-elect of the Nurses’ Alumni Association.